We have been repairing Rolex watches for over 35 years. Our Watchmaker has studied and trained with Rolex in order to provide the best possible service. Aaron Recksiek is WOSTEP certified and has received additional training after certification. All Rolex watch repairs are estimated and completed by a certified Watchmaker. We do all our repairs on the premises. We offer a 2 year guarantee on complete overhauls. We use only Genuine Rolex parts. All watch repairs are performed to factory specifications. How often should my Rolex be serviced? The manufacturer suggests having your Rolex watch serviced every 5 years. Like any mechanical machine, it requires cleanliness and proper lubrication to maintain reliable and consistent functionality. What is included with your Complete Rolex Overhaul? We only use ALL genuine Rolex parts sent to us directly from the manufacturer. The techniques used to overhaul your Rolex were taught to us by Rolex Instructors and the techniques we use meet or exceed the standard Rolex uses at their service centers. 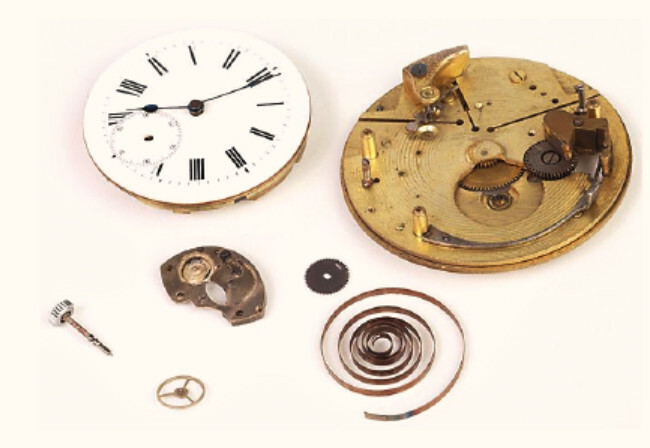 The Mechanism - Each overhauled watch movement is completely dissembled, the parts are cleaned meticulously, and then they are examined under a microscope (up to 60x magnification) to ensure all worn or damaged components are replaced or refurbished. The overhaul always includes a new mainspring. The Case and Bracelet - Each overhauled watch receives all new gaskets, a new case tube, and new springbar pins. If your watch has an acrylic crystal it will be replaced , and all sapphire crystals will be examined closely to determine the necessity of replacement. The crown will be cleaned and tested to determine if it meets the watch sealing requirements. All seal surfaces are examined and refurbished to maintain the integrity of the water tight case. The case and bracelet are then refinished with the original finishes to make your watch look like it did the day it was new. How long does the service take? The turn around of a complete overhaul is usually about 3-4 weeks. I sent my watch to Rolex for service, but they told me it's too old and they can't fix it!!! Can you service my watch? Many parts in older Rolex models have been discontinued and are no longer available to be ordered from Rolex. We have a comprehensive network of other watchmakers and suppliers worldwide and almost any part can be obtained. Additionally as a result of our extensive training and tooling setup, we can also manufacture almost any obsolete part needed. Do you service fake or replica watches? It is illegal to manufacture any product that violates copyright laws. We have a stellar relationship with most Swiss watch manufacturers and would not want to tarnish our relationship by condoning the illegal reproduction of their product. Therefore we refuse to service any watch that has violated copyright laws.